Standing Rock Protesters Remain At Dakota Access Pipeline Site, Despite Warnings. 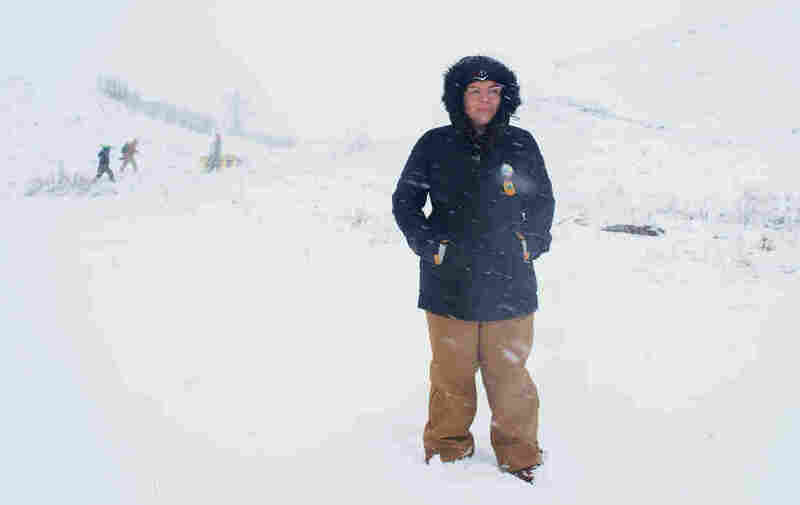 Here's Why As winter settles in, the leader of the Standing Rock Sioux tribe has asked many of the pipeline protesters to head home. Here are the stories and portraits of some of those who joined the protests. Winter has descended on North Dakota. A blizzard swept through the state earlier this week, shutting down nearly 300 miles of interstate highway there. And the weather doesn't promise to relent in the coming months. 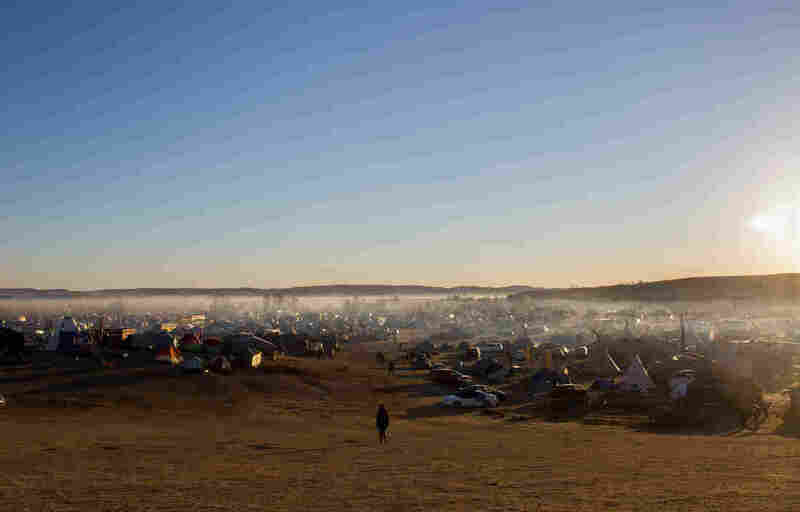 In the midst of it all, a large group of protesters remains at the temporary camps on the northern edge of the Standing Rock Sioux Reservation. The movement, which started in early 2016, had small roots but grew into the thousands, drawing support from Native Americans from across the country, as well as activists who joined in solidarity against the proposed route of the 1,172-mile Dakota Access Pipeline just north of the reservation. Last week those protests won a concession from the federal government: The Army Corps of Engineers announced it would deny the permit necessary to build the oil pipeline in that area. 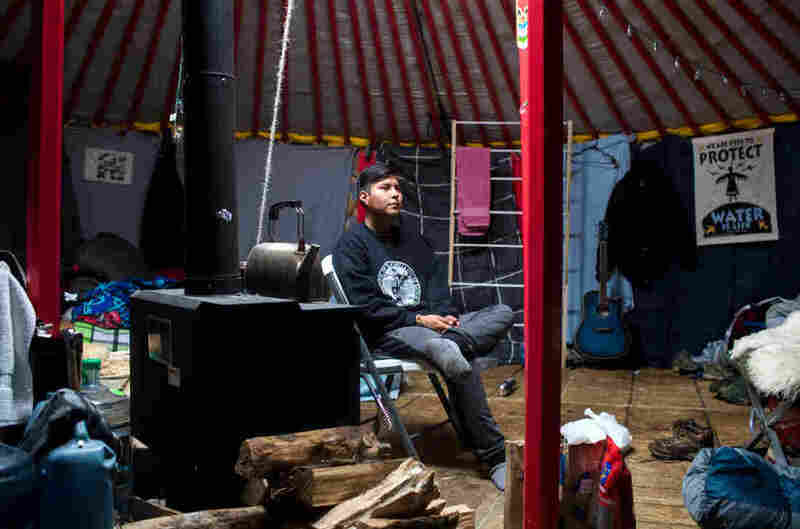 And now, with an eye toward the impending winter weather, the chairman of the Standing Rock Sioux tribe in North Dakota is asking people camping near the route to go home. Still, many "water protectors" have vowed to hold their ground. Here are some of their own stories, their experiences at the camp and their reasons for joining the protest — in their own words. Rachelle Figueroa, 65, holds her pipe bag, which houses her chanupa, a sacred ceremonial pipe. She also holds colored prayer flags — each color representing prayers held for the cardinal directions and for Mother Earth. "Mother Earth is our mother. She's everything. She's life. She brings life, she takes life. We get everything from her; we get our food, our shelter, medicines. The water flows through her creeks, the lakes, sacred places. This is why we're here. This is why we chose this planet, because of her. It's everything. 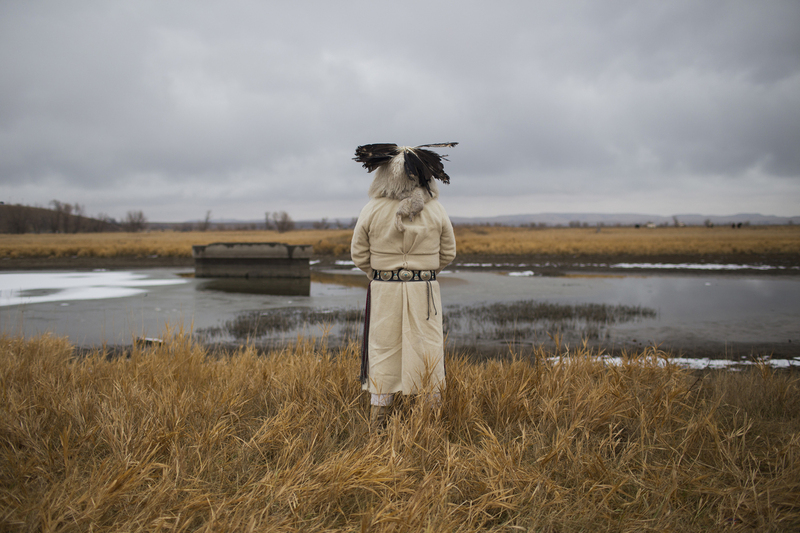 "My work [at Standing Rock] has been to do the traditional ceremony, and to bring the youth to the elders so that they can learn, and hear, and heal. ... That's why I came, mostly, was to pray, and to hold a sacred place so women would be able to come in and heal, and be able to have that strength — that rejuvenation that they need in order to keep doing what they're doing. "It's going to be hard to get people back on track, but it's the women that will do it. It's the women that will stand up and say enough is enough. We've had enough of that. Anger, fear, all that doesn't work. What works? Love, compassion, forgiveness, all those things work." Candace Ducheneaux, 67, is Oglala Sioux from the Cheyenne River Reservation. She and her family were relocated when she was 10 years old, when portions of the reservation were flooded in the 1960s due to the construction of the Big Bend Dam in South Dakota by the Army Corps of Engineers. "What we have to do is start harvesting the rainwater and heal the world water cycle. That's what I wanted to get around to. That's what happened when they flooded our lands down there, is they wholly interrupted the water cycle that is necessary to regeneration of life. "What we have to do is repair that water cycle. The way to do that is to re-establish the small water cycle over our own micro-environment. That means we all have to take responsibility. They say water restoration begins in your own backyard. You have to start thinking of your own self and how you can do it. Like I said, all of humanity has to become involved." 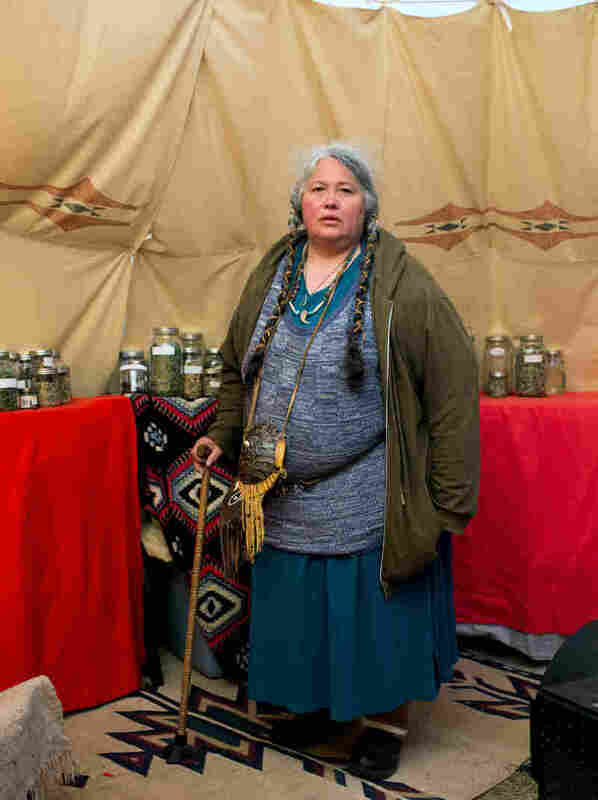 Daphne Singingtree, 65, is a traditional practitioner and a medicine maker from Eugene, Ore., though her father's side of her family is from Standing Rock. 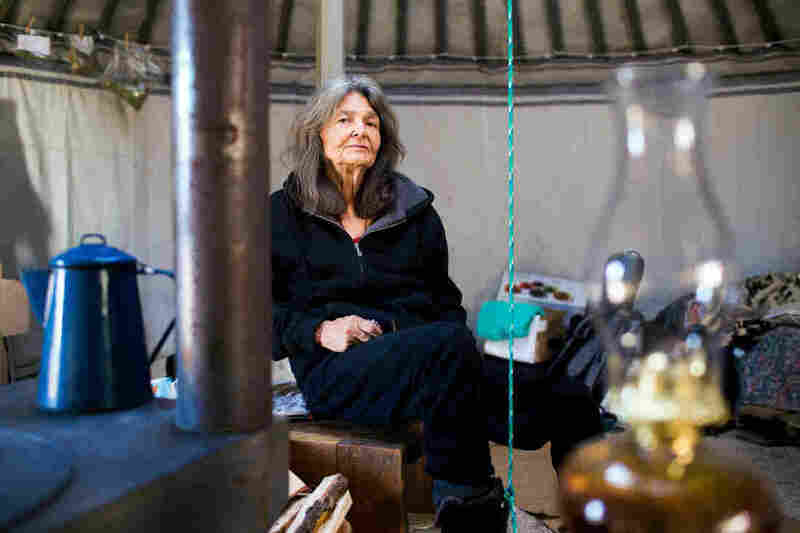 She has been at Standing Rock for weeks at a time, driving from Oregon to North Dakota with a truck of supplies and belongings. "I inherited land here so this is my fight. It's personal. "I like to say that what we're going through right now is like a labor and a birth, that the movement is really in the works. Like now, [it's] experiencing some labor pains and that's why there's some chaos and disorganization. A lot of people have never done anything like this before. Indian country is not real rife in political activism. ... Both tribal and indigenous people as well as supporters from all walks of life and all nations, all together for this one force of protecting the water. "It's more than this pipeline, on this land, at this time. I see this movement continuing on. " Eryn Wise, 26, is a member of the Jicarilla Apache Nation and Laguna Pueblo Nation in New Mexico. She is the media liaison at the International Indigenous Youth Council and media coordinator at Sacred Stone Camp at the protest site. "The water is a woman, this great mother who's just always providing life; endlessly, tirelessly providing life. And I've always felt such a deep love for the water just because she brings so much to us. She helps us renew. She helps us wash away, she helps us restore. "Now, I just feel bad for giving my mom a hard time because I'm older, and I get it. I get why it is we pray for the birds and why we pray for the sky, why we pray for the earthworms and why we pray for the grass. All these different things; I understand why there's so much beauty in the day-to-day things." "Sometimes it scares me when I have those realizations. At least I'm here and at least I'm with people who understand why it's so important. Our fight is so important is because not a lot of people understand; obviously if they did, we wouldn't be getting beat up by police to protect the most basic and beautiful thing." 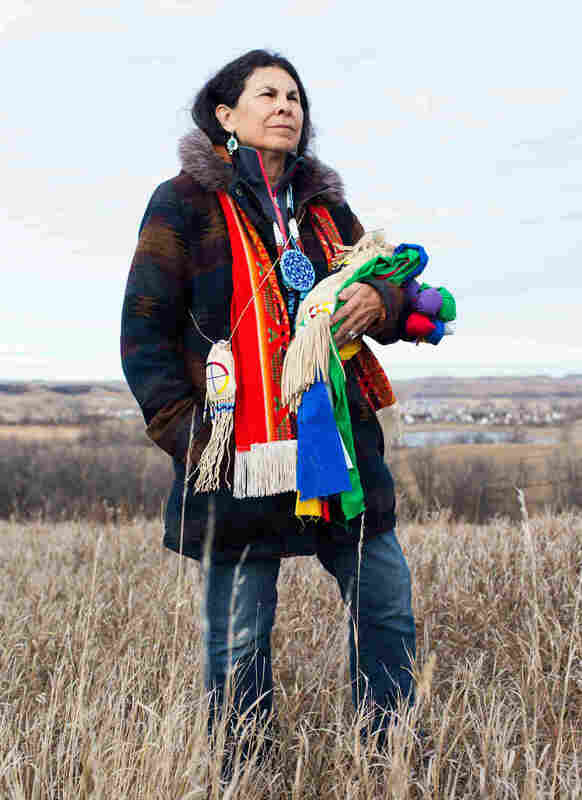 Lee Plenty Wolf, 60, is Oglala Lakota from the Pine Ridge Reservation. 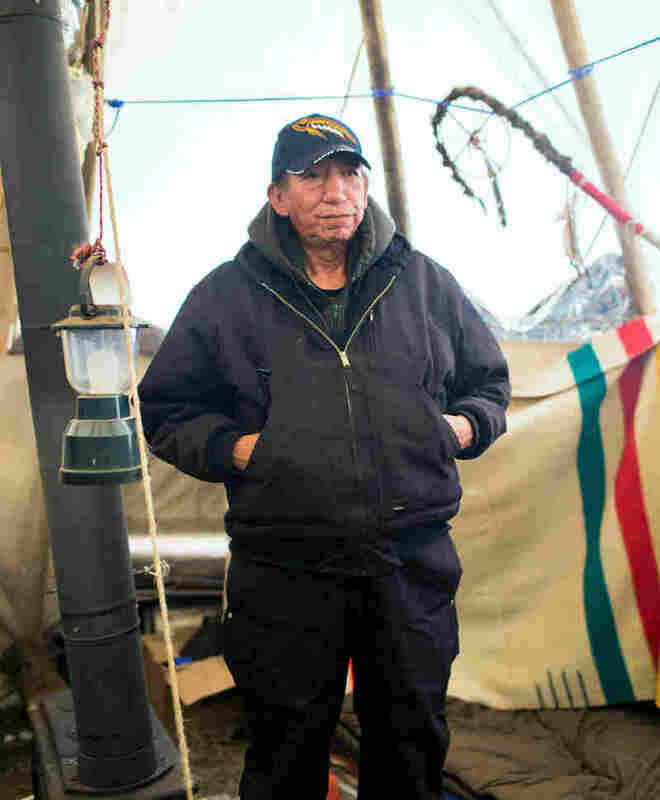 He is one of the lead elders at Standing Rock and mentor of newly elected young headsmen of the Oceti Sakowin Camp at the protest site. "We've lost a lot of land to history. We have to stand up for our rights. "Usually I get up and I look to the east to pray. You know, even if it's a small prayer. But [on the third morning I was here], I glanced at the east, and I looked to the north, and the first vision that came to me was Wounded Knee, the first massacre. You know? I got a little emotional. "That's when I decided I couldn't leave." Jeanne Dorado, 36, is the principal of of Sacred Stone Community School. She is 31 weeks pregnant. 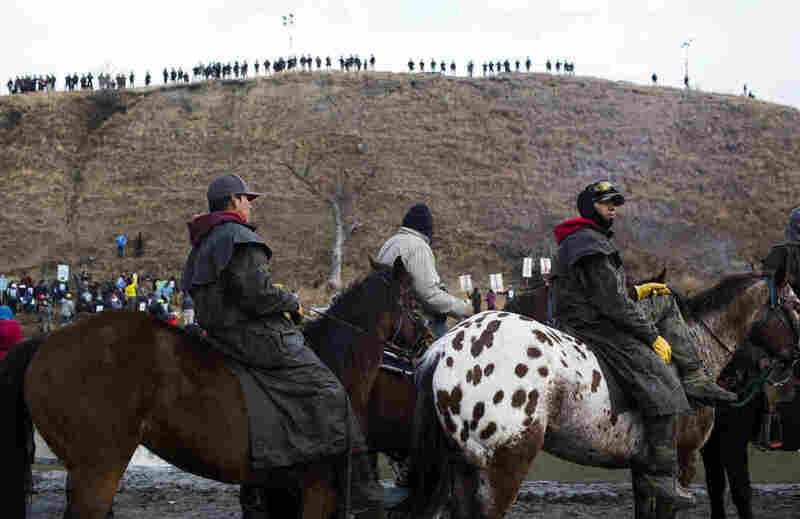 "[The Lakota people] put out the call; we're all here. There's over 400 — probably more — tribes represented. It's a coming together that not even the Native folks of North America have ever seen. And it's wonderful timing because Native folks around the world — we're all finally, we're just done. We've played the game, we let you think that it worked, we got to where we are. Now we're all sick, now the planet is dying, now we're running out of natural resources. Now I think it's time to listen. "[It's] definitely a sea change in the way nations stand together. The native folks here have never come together like this in agreement over something beautiful, which is love and spirit, and our common future, which is the children." Alexander Howland, 21, traveled to the protest site from Dulce, N.M., on the Jicarilla Apache Reservation. He arrived in mid-August, intending to stay for a week, but he has ended up staying into the winter. "We are made up of water, we are born in water, we come from water. Water is an essence of our being. A lot of people don't see it, but we are connected to that water. We are water. That's why a lot of us are here. That's what water means to us: it means life, it means unity, it means one people, it means all these things because we're all connected, because of water. "I've grown so attached to this place, I've grown attached to the people, I've grown attached to the land, the water, the air. It's because of the Lakota and Dakota people that I now have new eyes to view the world that we live in. and to get back into that sense of tradition and prayer. "I'm going to stay as long as it takes to ensure the safety of our future generations, to make sure that they have water for their children, for my children, for my future generations to come, for everyone's future generations to come. I'm not going anywhere until I see the drilling equipment leave. I'm not going to go until they dissemble that drill and leave this place for good." An elder looks out to Turtle Island.